Some biographers and others who write about famous musicians make the claim in their books that, with respect to musical composition, nothing can be created in pain. This is their own theory because they've never tried it themselves; they maintain that pain leads to a dry spell in a composer's creativity, and the resumption of production of works after such a dry spell is the surest proof that a composer is already out of pain. On its surface, the thought seems reasonable, and for those in the mainstream who have never tried to compose their own music this myth is accepted as fact. Whoever is convinced of this is laboring under a serious misconception. Pain, in and of itself, can certainly distract and may slow a composer down considerably, but it has no effect on their compositional skills, neither does it utterly rob them of the well-spring of inspiration. The photo shows the J.S. 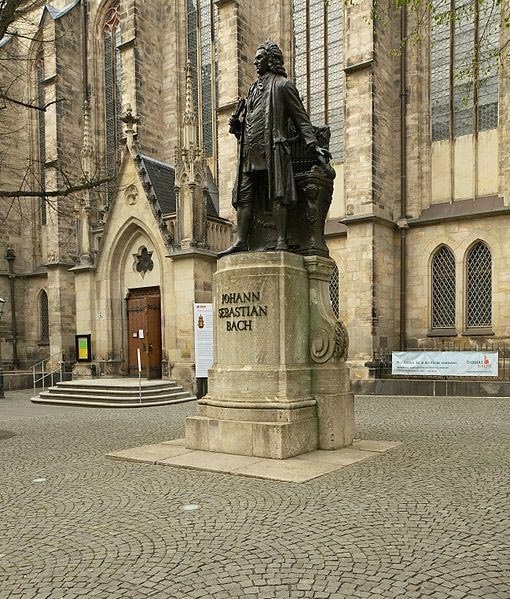 Bach monument by Karl Seffner erected in 1908 on the south side of the St. Thomas Church in Leipzig. The subject of this monument dictated his last composition to a son-in-law during a time when he (Bach) was in considerable misery and both of his eyes were bandaged and blindfolded -- he had been blinded and very seriously weakened by 2 horrible, unsterile, botched operations on his eyes and the noxious and damaging medical treatment which followed. What's important to remember here, is that the awful misery he was in, at the time, failed to derail his composing; it certainly slowed him down to a crawl, no question, but, the fact of the matter is, as far as can be known, he began composing his own music around the age of 18 in Arnstadt and what followed was nearly a half century of white hot creativity right up to the very end of his life. Since he composed entirely from the mind away from the instrument(s) and compelled the scholars who studied with him to do the same (his pupils have been counted -- there were 81, and at least 46 of them went on to become professional organists), he required no instrument, paper, or ink in front of him, no goose quill pen in his hand, not even his eyesight, to bring a new piece of music into existence -- a well popularized historical fact. With an immensely gifted musician such as Bach, that gift is anything but a pleasure; it is something to which one is doomed. This great artist had no choice, each and every day of his life, but to explore the cosmos of his music in whatever physical condition he found himself, whatever wretched performing circumstances he had to work with, how meager his income was, how resentful or obtuse his superiors or authorities over him happened to be, or how deeply in sorrow or despair he was or how bitter his disappointments; he went right on creating because he had to. His true life has shown us, among so many other things, that the chief ability of a genius consists in pursuing his objectives with a far greater intensity than average people can even imagine. In much the same way Beethoven, for his part, suffered untold mental anguish as he gradually lost his hearing; it can be argued that much of the mental pain he experienced from that was probably the worst any serious musician could suffer. If pain had any negative effect on creativity, then many major works of his, which included the 5th Symphony and a host of others that gestated in his mind for years, probably never would have been written; this inference is perfectly logical. Instead just the opposite happened. The sapping of our strength by serious illness, the misery and morbidity associated with certain surgeries we may have to endure, the noxious side effects of medicines, our mental state, and other factors related to our health can certainly affect how well and at what speed we can continue composing our music. And pain is often associated with all of that. But the truth is, pain has no effect on inspiration or any learned powers to do something competently. It can't take away a composer's skills or deny a kiss from the Muse; these will still be operative and forthcoming when composers sit down to do their work.